UFV nurses have high success rates in licensing exams. Before graduating, UFV Bachelor of Science in Nursing students must pass a licensing exam known as the NCLEX (National Council Licensure Examination). January 2015 marked the first time this particular exam was written by Canadian nursing students as part of the process of becoming a licensed nurse in Canada. In general, BC students perform consistently well in this test, and UFV students are leading the way. To date, three UFV grad classes have written the exam and the results are impressive. 100% of the first group to write passed the test. 98% of the three groups in total to have written the test have passed on the first or the second writing. This is well above the national average and reflects the teaching philosophy at UFV, says Director of Health Studies Hannah MacDonald. “We’re proud of our grads and I think this level of performance indicates the quality of our nursing faculty, our instruction philosophy, and our curriculum. 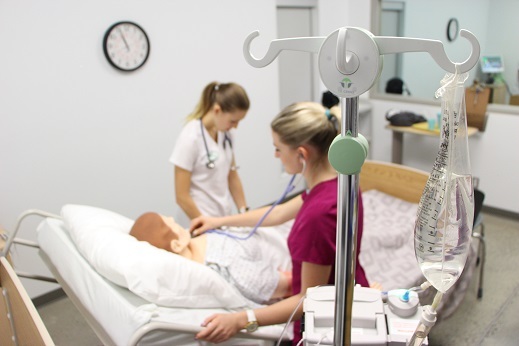 The UFV approach, with a strong emphasis on developing clinical decision-making and integrated theory, supports our students’ success and makes our graduates highly sought after by health care employers,” MacDonald explains. The Bachelor of Science in Nursing (BSN) program at UFV offers instruction in nursing, health sciences, social sciences, and research, and an opportunity for advanced focus in a number of health-care areas.